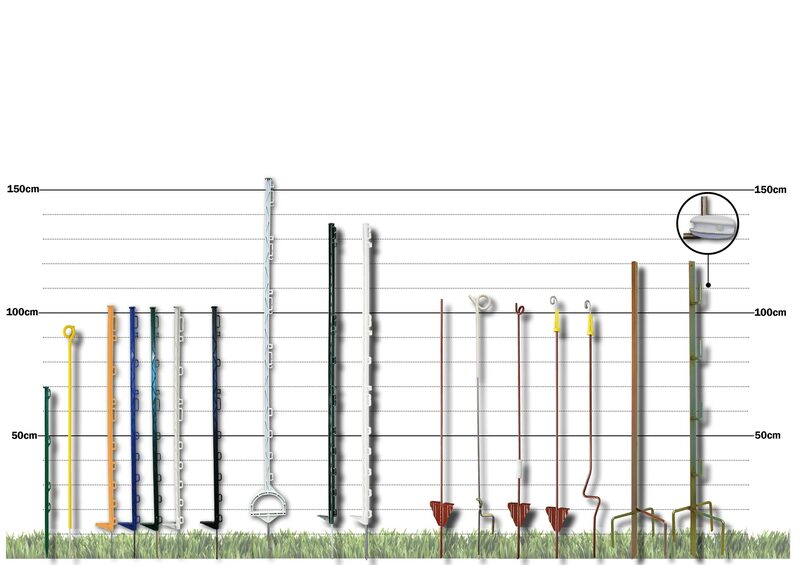 Here we have our range of electric fence posts with something to suit virtually all temporary, semi-permanent and permanent electrified fencing requirements. We have chosen to include only the higher quality grades of electric fence posts available on the market so you can have confidence in what you’re purchasing. For less exacting fencing requirements please review our budget “paddock range” in the budget & clearance section where you will find posts that are designed for shorter runs and for temporary fence systems. Fence posts included in this section are manufactured from metal, wood or high grade plastic. The metal and wooden posts will require insulators in order to fix your fence lines. The plastic posts, because they are already insulated, incorporate guides, cradles, slots or holes to support the fence lines at fixed heights. As a rule of thumb, you will need to position fence posts between 5m and 7m apart. In sheltered areas and with more highly tensioned fence lines you will be able to extend this distance between posts, but in exposed and/or rough terrain the opposite may also be true. The better your anchor posts at the start, corners and end of the fence, the greater the fence post separation distance you will be able to get away with along the straight lengths. Please note that we do not recommend the use of plastic posts for fence corners, ends of the fence line, or with 40mm tape. High quality electric fence posts from electric fence online.